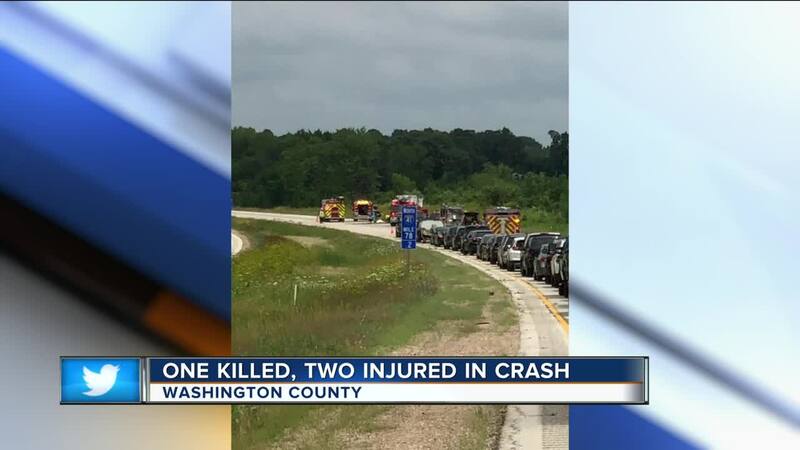 One person was killed and another two were hospitalized after a crash on I-41 in Washington County Saturday morning. The Washington County Sheriff’s Office said in a news release that at about 11 a.m. they were called out to I-41 near County Highway D for a car on fire, and that people were trapped in their cars after a crash. A passerby put out the fire with a fire extinguisher and another person was doing CPR on the side of the roadway to a man that was injured in the crash. One of the two females in the other car was trapped, and the jaws of life were needed to get out of the car. Witnesses told the sheriff’s deputies that a southbound car crossed the median and hit a northbound car nearly head-on. The male driver of the southbound car was ejected from the car and died at the scene. The two females in the other car were transported to Froedtert Hospital. One of them was transported via Flight for Life with “serious” injuries. The interstate was closed to both directions of traffic for more two hours. Traffic has now opened back up in both directions.